Jocko dates back to the Revolutionary War. 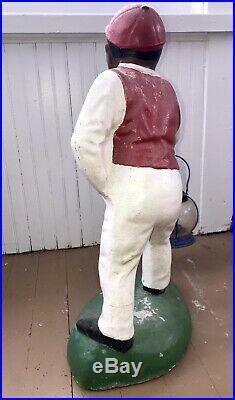 This sculpture is in Excellent condition, wear consistent with age and use. 26.5 TALL & HEAVY. Gravess story is a short and tragic one. It begins on Christmas Eve, December of 1776, with General George Washingtons crossing the Delaware River to battle the British Army. A local African American man, Tom Graves, answered the call for local militia men to fight in the generals army. Gravess son, Jocko Graves, was only twelve years old, but he followed his father into the army, ready to fight the enemy. General Washington, upon hearing about young Jocko, was astonished at his readiness to engage in battle. The general, however, deemed Jocko Graves too young to be involved in battle and ordered him to tend to officers horses and keep a lantern burning, so the soldiers would know how to return to camp after the fighting ended. Meanwhile, General Washington and his army boarded boats and began the crossing of the icy Delaware River. A blizzard that night delayed some of Washingtons solders from making the crossing with the main body, and two soldiers died of hypothermia before reaching the Christmas Day battle the next morning. Washington was so moved by the boys dedication that he commissioned a statue of The Faithful Groomsman to stand in honor of Graves at the Generals estate in Mt. Over time, the statues original form changed, and its origin story was forgotten. 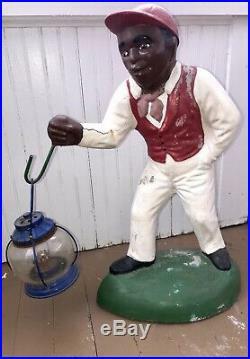 The statue became known as The Lawn Jockey and by the mid-nineteenth century was usually depicted as the racial Sambo character, with very dark skin and big protruding lips. It was also often used as a hitching post for horses and made out of cast iron, while others were used as ornaments for front lawns. 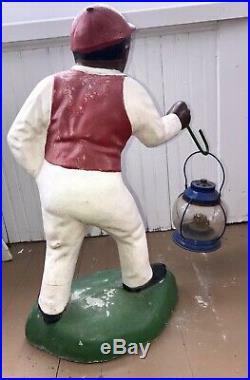 Some accounts claim that the statue was used to signal Underground Railroad station stops. 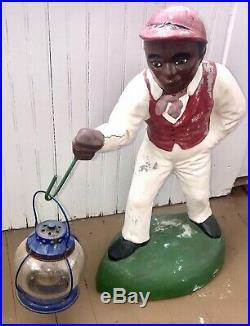 According to these accounts, an American flag in the hand of the statue signaled runaway slaves that it was safe to stop at that home. 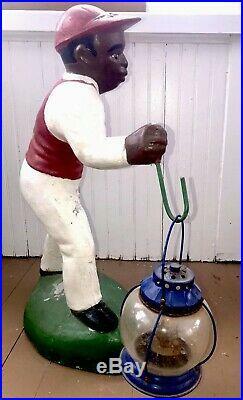 Also, dressing the statue in a striped shirt meant that a fugitive slave could obtain a horse. 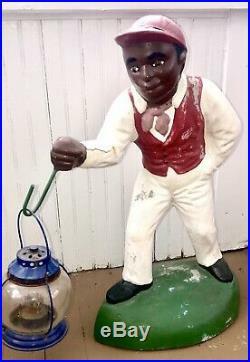 Contemporary historians now describe the origins and ironic uses of the lawn jockey statue as a testament to the memory of Jocko Graves. 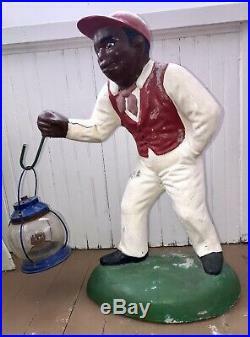 The National Great Blacks in Wax Museum in Baltimore, Maryland, features one of the earliest surviving versions of the statue. Or there is this possibility. At the first Kentucky Derby in 1875, 13 of the 15 riders were African Americans, and blacks rode the winners of 15 of the first 28 Derby races. 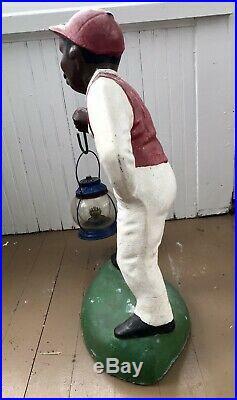 Jocko, as it this statue is so commonly called continues to be shrouded in mystery. Whatever you choose to believe this is truly a part of history that is becoming increasingly difficult to find in antique vintage form/condition, beware of the many replicas currently made. Fully insured and professionally packaged. Please ensure you give me the best contact number. Be sure to bring photo ID for package release and help to carry your package. Greyhound does not offer assistance. However, they are usually pretty good about allowing you to pull up curb side to load. 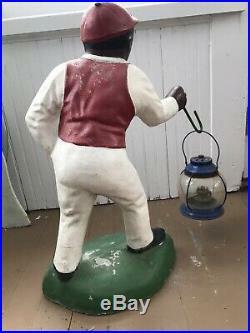 The item "Antique Cement Black Americana Lawn Jockey Hitching Post Jocko Yard Statue" is in sale since Thursday, March 21, 2019. 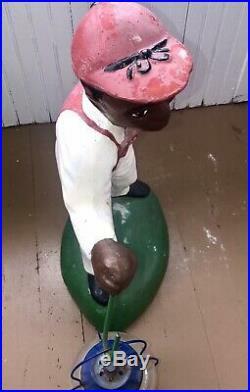 This item is in the category "Collectibles\Cultures & Ethnicities\Black Americana\Figures & Sculptures". 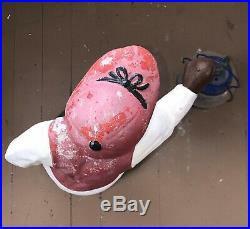 The seller is "trybe-of-gypsies" and is located in Lake George, New York. This item can be shipped to United States, Canada, United Kingdom, Denmark, Romania, Slovakia, Bulgaria, Czech republic, Finland, Hungary, Latvia, Lithuania, Malta, Estonia, Australia, Greece, Portugal, Cyprus, Slovenia, Japan, China, Sweden, South Korea, Indonesia, Taiwan, Thailand, Belgium, France, Hong Kong, Ireland, Netherlands, Poland, Spain, Italy, Germany, Austria, Bahamas, Israel, Mexico, New Zealand, Singapore, Norway, Saudi arabia, Ukraine, United arab emirates, Qatar, Kuwait, Bahrain, Croatia, Malaysia, Chile, Colombia, Costa rica, Panama, Trinidad and tobago, Guatemala, Honduras, Jamaica, Barbados, Bangladesh, Bermuda, Brunei darussalam, Bolivia, Egypt, French guiana, Guernsey, Gibraltar, Guadeloupe, Iceland, Jersey, Jordan, Cambodia, Cayman islands, Liechtenstein, Sri lanka, Luxembourg, Monaco, Macao, Martinique, Maldives, Nicaragua, Oman, Pakistan, Paraguay, Reunion, Uruguay.